-John Bergamo, Director of Percussion at CalArts and Marla’s frame drum guru. The frame drum originated in India and the ancient Middle East more than three thousand years ago, and reached medieval Europe through Islamic culture. Today, frame drums can be found in almost every culture in the world, and are being used in classical and contemporary music, including jazz, rock and chamber ensembles. Marla Leigh’s Intensive Workshops — which can range from three-hour to full-day clinics—introduce university-level students to frame drumming techniques, rhythms and improvisational and compositional skills. Hands-on playing techniques in the Lapstyle, Freehand and Upright frame drum styles. How to play snaps, rolls and other extended frame drum techniques. Introduction to other types of frame drums, including the Middle Eastern Riq and South Indian Kanjira. 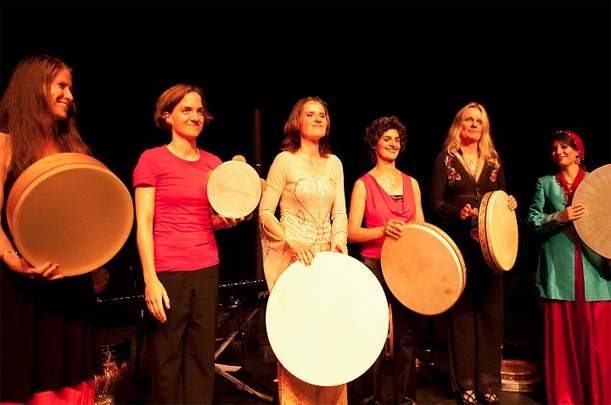 Learn how to play and improvise with traditional Middle Eastern, Indian and Persian rhythms. Handouts provided with select rhythms, so students will learn both how to read and write rhythms. An introduction to the world of South Indian “Solkattu,” traditional vocal exercises that strengthen the understanding of rhythm. Learn how to use these Solkattu phrases within your drumming. Exercises can be applied to ANY type of musician. Techniques to help students easily improvise in ANY meters, even compound/complex meters. 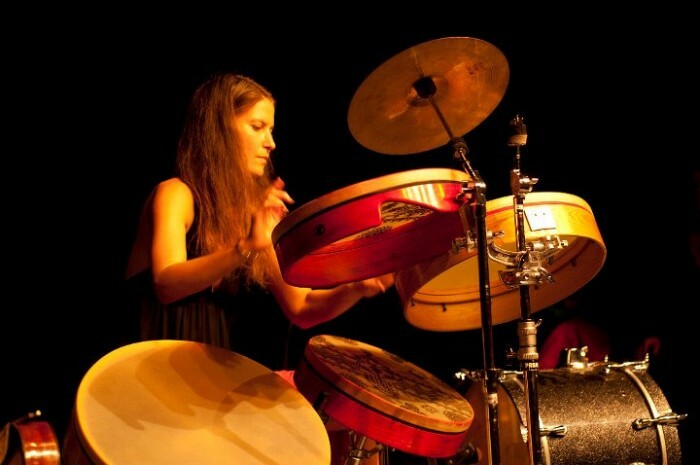 Techniques taught are based on theories from the traditional North and South Indian drumming repertoire. How to compose for hand drums, based off of South Indian, North Indian and Middle Eastern rhythmic theories. An easy and logic way to notate for hand drums. How to develop frame drum compositions for solo, duet, group and ensemble. Marla’s one-day intensive workshops can be tailored to students’ levels and specific areas of interest. She provides handouts, including notated compositions and etudes, which are invaluable resources. She may also provide a composition before hand, so students can learn how to read music written for hand percussion. Workshops can be scheduled to include a solo concert – TakaPaPaPa – Art of Frame Drumming (see below), in which Marla demonstrates the sounds and styles of the many varied and fascinating types of frame drums. In this special solo concert, Marla demonstrates the various frame drums, flutes, and ambient electronics. Using a looping pedal, she layers different rhythms, creating rich textures and polyrhythms. Some audience participation is included, where they learn about Solkattu and body percussion. This is an educational, engaging and fun musical performance. 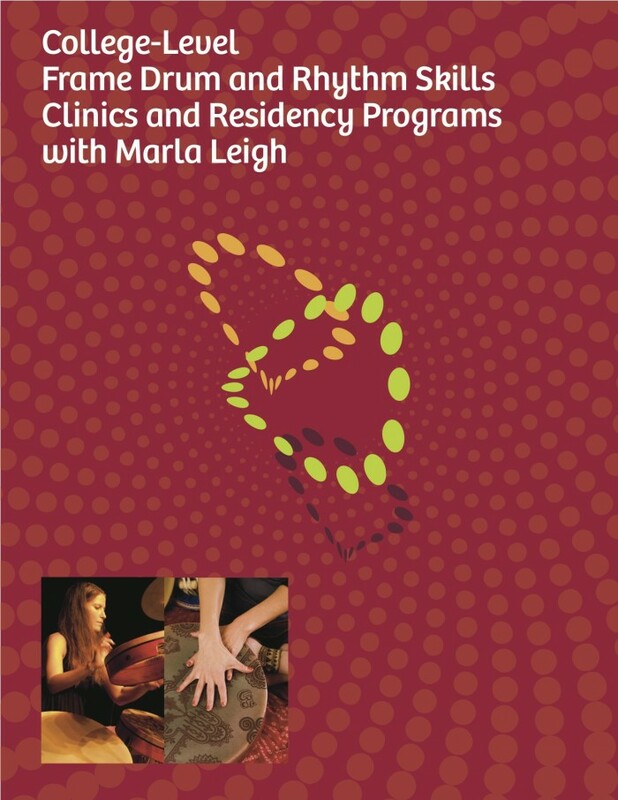 Marla’s signature residency program range from two days to a week — are designed for serious percussion students who wish to enhance and deepen their understanding and skills in improvisation, soloing, composing and performance. The ability to easily create an improvised solo in any meter is the mark of an accomplished and in-demand percussionist. Nothing speeds success more than the understanding of Indian Solkattu, which is based on mathematical divisions of time. This skill can transform students’ understanding of rhythm and their ability to improvise, especially for those with a classical music background. We will also explore Yatis (South Indian shapes), Tihais (rhythm patterns in traditional North Indian music) and more. 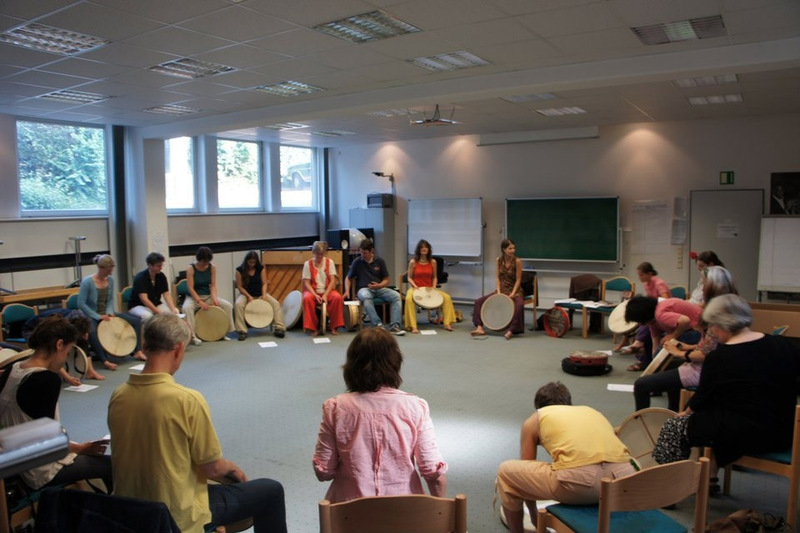 Students will compose, notate and perform their own original rhythms for frame drums in solo and duet settings, based on the call-and-response concepts of traditional West African drumming and on North and South Indian drumming theories. Prior to her arrival, Marla provides materials, including practice etudes and notation for an ensemble compo-sition for the students to preview and begin practicing. Students are encouraged to master the ensemble composition and perform in a percussion recital that can be scheduled for the end of the residency. Preparing for the performance helps students focus on and learn the material, and help them feel confident with their frame drum & improvising skills. University of Kentucky students playing Marla’s commissioned piece.